On September 15, 2018, in «Аvaza» National tourist zone grandiose project initiated by President Gurbanguly Berdimuhamedov - International rally “Amul - Hazar 2018”, was successfully finished. Awarding ceremony of winners of the rally took place on the square in front of the flagpole of Balkan velayat where special podium was built. 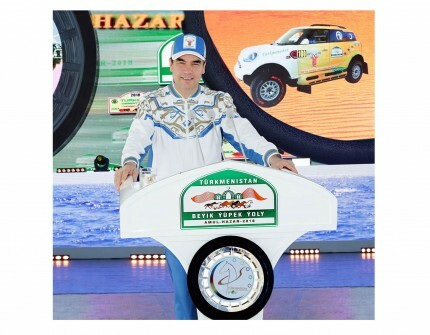 President Gurbanguly Berdimuhamedov and Director of “Africa Eco Race” Jean Louis Schlesser presented the winners of the competitions with special prizes – sets of memorable coins “Amul - Hazar 2018” and gift sets of national Turkmen dress. President Gurbanguly Berdimuhamedov congratulated the participants and winners of the competitions along the Silk Road across Karakum Desert and finished in Avaza National tourist zone, having wished great sport success to everyone. After, Jean Louis Schlesser expressed the gratitude to the President of Turkmenistan for high level organization and personal support. “Today, we sum up these competitions in Avaza and it is great honor for us to acknowledge their success”, he said presenting a special award of the “Africa Eco Race” to the Leader of the Nation as a true triumphant of the rally “Amul - Hazar 2018”. Then a ceremony of presenting the certificate of inclusion of horse named Akhan from Ahalteke Equestrian Complex of the President of Turkmenistan to the Guinness Record Book was held. Unusual abilities of that horse has been officially registered – it managed to pace rearing 10 meters for 4.19 seconds, having beaten previous record in this unique nomination by two times. In the evening the ceremony was followed by celebration concert with the participation of Turkmen and foreign popular artists, dance and folk ensembles of our country.